In order to enhance the performance of supercapacitor and reduce environmental pollution as far as possible, electrode materials especially low-cost and eco-friendly electrode materials with high energy density have attracted a great deal of attention. 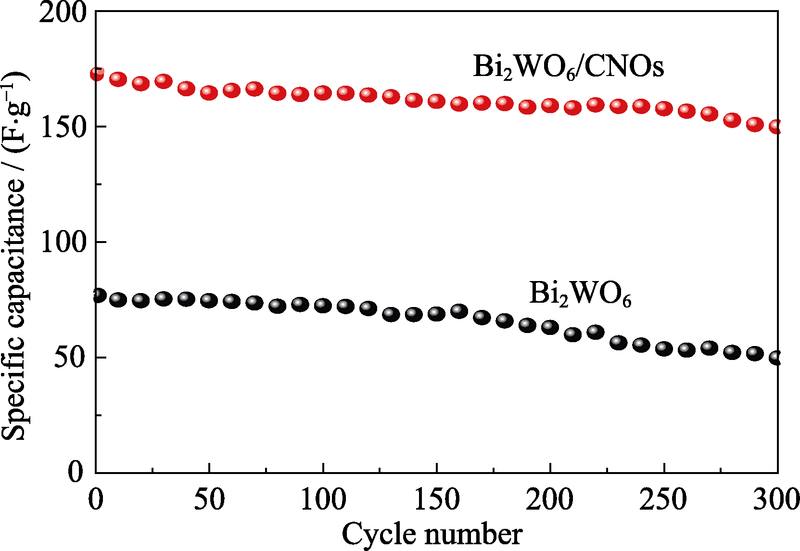 In this paper, Bi2WO6/CNOs (CNOs, Carbon Nano Onions) and Bi2WO6 nanocomposites have been synthesized via a hydrothermal method. And the structures and morphologies of samples were characterized by X-ray diffraction (XRD) and scanning electron microscopy (SEM). 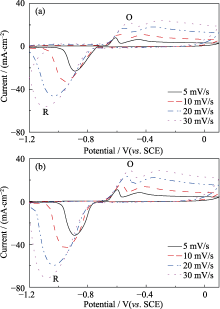 The electrochemical performances of the as-prepared samples were investigated by cyclic voltammetry, galvanostatic charge - discharge measurements and electrochemical impedance spectroscopy. At a current density of 2 mA·cm-2, the specific capacitance of the Bi2WO6/CNOs and Bi2WO6 was 328 F·g-1 and 218 F·g-1 with 1 mol·L-1 KOH served as electrolyte, respectively. 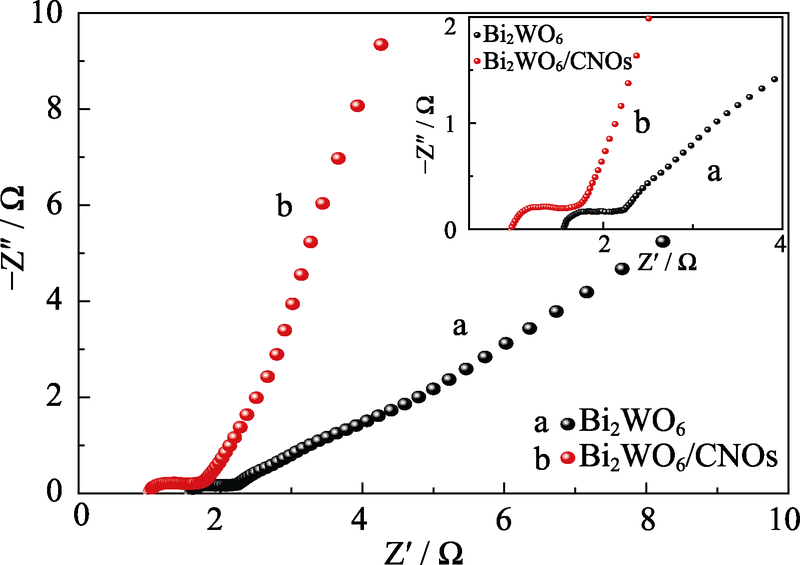 After 300 charge-discharge cycles at a current density of 5 mA·cm-2, the specific capacitance of the Bi2WO6/CNOs improved 34.37% compared with pure Bi2WO6. 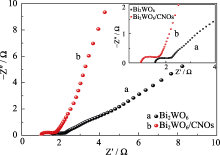 Thus, CNOs can enhance the electrochemical performance of Bi2WO6 obvously. 王佳玮, 杨艳青, 高泽宇, 梁颖, 邓钏, 张卫珂. 水热法合成Bi2WO6/CNOs纳米材料及其电化学性能[J]. 无机材料学报, 2018, 33(11): 1208-1212. Jia-Wei WANG, Yan-Qing YANG, Ze-Yu GAO, Ying LIANG, Chuan DENG, Wei-Ke ZHANG. 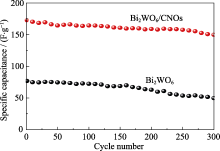 Electrochemical Performance of Bi2WO6/CNOs Nanocomposites Synthesized via a Hydrothermal Method[J]. Journal of Inorganic Materials, 2018, 33(11): 1208-1212. (a) CNOs、(b) Bi2WO6和(c) Bi2WO6/CNOs的SEM照片以及(d) XRD图谱"
 JABEEN N, HUSSAIN A, XIA Q Y, et al. 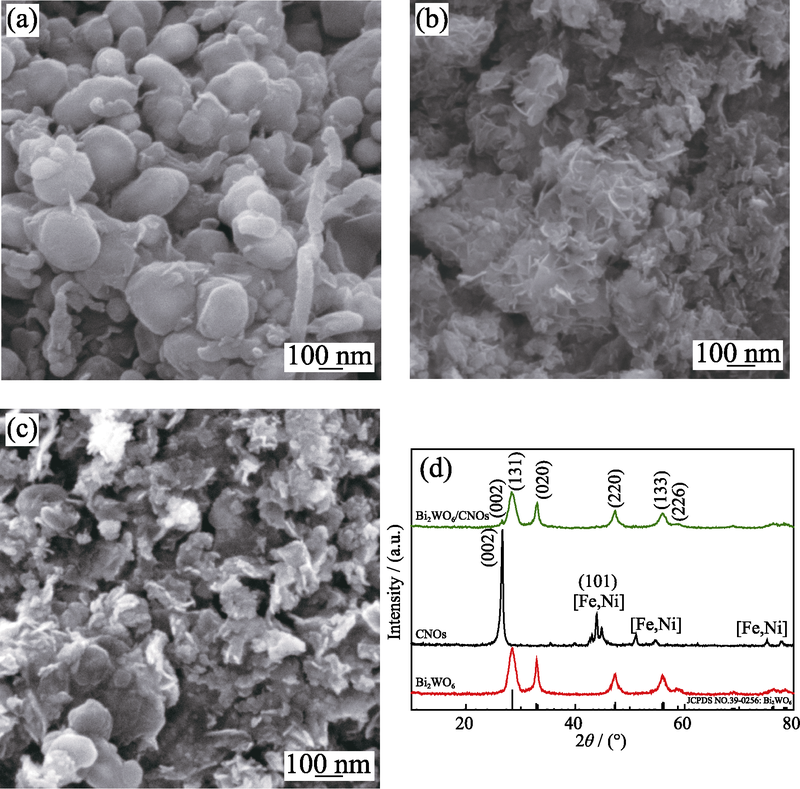 High-performance 2.6 V aqueous asymmetric supercapacitors based on in situ formed Na0.5MnO2 nanosheet assembled nanowall arrays. Adv. Mater., 2017, 29 (32): 1700804-1-9. XIE Y X, LU L S, TANG Y, et al.Hierarchically nanostructured carbon fiber-nickel-carbon nanotubes for high-performance supercapacitor electrodes.Mater. Lett., 2017, 186: 70-73. 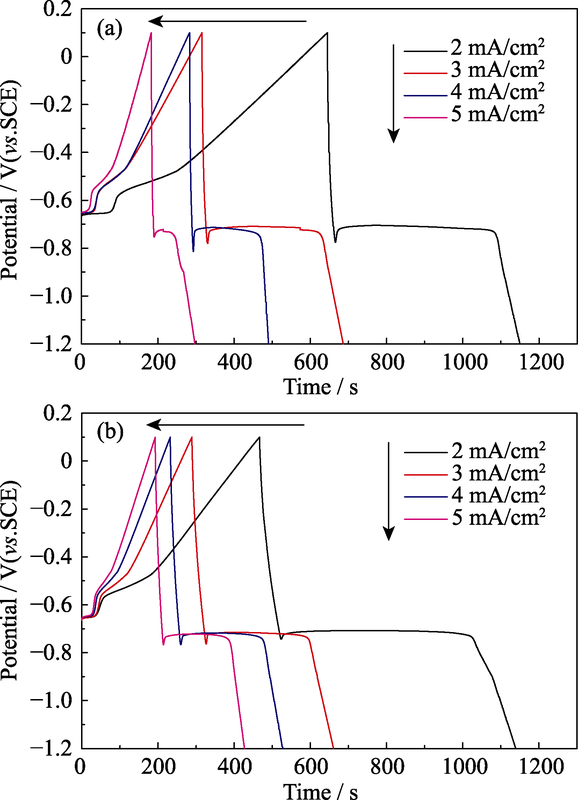 XIAO Y H, SU D C, WANG X Z, et al.Layered double hydroxides with larger interlayer distance for enhanced pseudocapacitance.Sci. China Mater., 2017, 61(2): 263-272. CHEN S M, YANG G, JIA Y, et al.Three-dimensional NiCo2O4@NiWO4 core-shell nanowire arrays for high performance supercapacitors.J. Mater. Chem. A, 2017, 5(3): 1028-1034. YAN H, BAI J, LIAO M, et al.One-step synthesis of Co3O4/graphene aerogels and their all-solid-state asymmetric supercapacitor.Eur. J. Inorg. Chem., 2017, 2017(8): 1143-1152. YIN S, WU Y Q, XIONG Q Q, et al.Flower-like NiO with hierarchical and mesoporous structure for supercapacitor.Chemelectro., 2017, 4(10): 2563-2570. NITHIYANANTHAM U, EDE S R, ANANTHARAJ S, et al.Self-assembled NiWO4 nanoparticles into chain-like aggregates on DNA scaffold with pronounced catalytic and supercapacitor activities.Cryst. Growth Des., 2015, 15(2): 673-686. GHASEMI S, HOSSEINI S R, BOORE-TALARI O.Sonochemical assisted synthesis MnO2/RGO nanohybrid as effective electrode material for supercapacitor.Ultrason. Sonochem., 2018, 40(Pt A): 675-685. LI J S, LU W B, YAN Y S, et al.High performance solid-state flexible supercapacitor based on Fe3O4/carbon nanotube/polyaniline ternary films.J. Mater. Chem. A, 2017, 5(22): 11271-11277. MARUTHAMANI D, VADIVEL S, KUMARAVEL M, et al.Fine cutting edge shaped Bi2O3 rods/reduced graphene oxide (RGO) composite for supercapacitor and visible-light photocatalytic applications.J. Colloid Interf. Sci., 2017, 498: 449-459. NITHYA V D, HANITHA B, SURENDRAN S, et al.Effect of pH on the sonochemical synthesis of BiPO4 nanostructures and its electrochemical properties for pseudocapacitors.Ultrason. Sonoche., 2015, 22: 300-310. CHOI D, JAMPANI P H, JAYAKODY J R P, et al. Synthesis, surface chemistry and pseudocapacitance mechanisms of VN nanocrystals derived by a simple two-step halide approach.Mater. Sci. Eng. B, 2018, 230: 8-19. NITHYA V D, SELVAN R K, KALPANA D, et al.Synthesis of Bi2WO6 nanoparticles and its electrochemical properties in different electrolytes for pseudocapacitor electrodes.Electrochim. Acta, 2013, 109(6): 720-731. 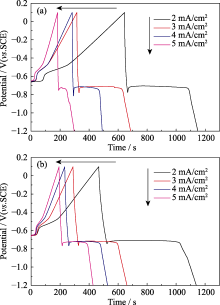 HAI Z, AKBARI M K, XUE C, et al.Atomically-thin WO3/TiO2 heterojunction for supercapacitor electrodes developed by atomic layer deposition.Comp. Comm., 2017, 5: 31-35. AMBADE R B, AMBADE S B, SHRESTHA N K, et al.Controlled growth of polythiophene nanofibers in TiO2 nanotube arrays for supercapacitor applications.J. Mater. Chem. A, 2017, 5(1): 172-180. NITHYA V D, SELVAN R K, VASYLECHKO L, et al.Effect of carbon coating on the electrochemical properties of Bi2WO6 nanoparticles by PVP-assisted sonochemical method.J. App. Electrochem., 2015, 45(5): 473-485. 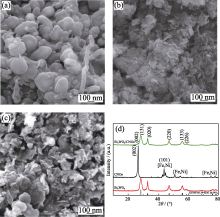 JIAO Y, LIU Y, YIN B S, et al.Hybrid α-Fe2O3@NiO heterostructures for flexible and high performance supercapacitor electrodes and visible light driven photocatalysts.Nano Energy, 2014, 10: 90-98. LIU M X, ZHAO F L, ZHU D Z, et al.Ultramicroporous carbon nanoparticles derived from metal-organic framework nanoparticles for high-performance supercapacitors.Mater. Chem. Phy., 2018, 211: 234-241. LU W J, HUANG S Z, MIAO L, et al.Synthesis of MnO2/N-doped ultramicroporous carbon nanospheres for high-performance supercapacitor electrodes.Chinese Chem. Lett., 2017, 28(6): 1324-1329. IIJIMA S.Direct observation of the tetrahedral bonding in graphitized carbon black by high resolution electron microscopy.J. Cryst. Growth, 1980, 50(3): 675-683. ZHANG W K, FU J J, CHANG J, et al.Fabrication and purification of carbon nano onions. New Carbon Mater., 2014, 29(5): 398-403. 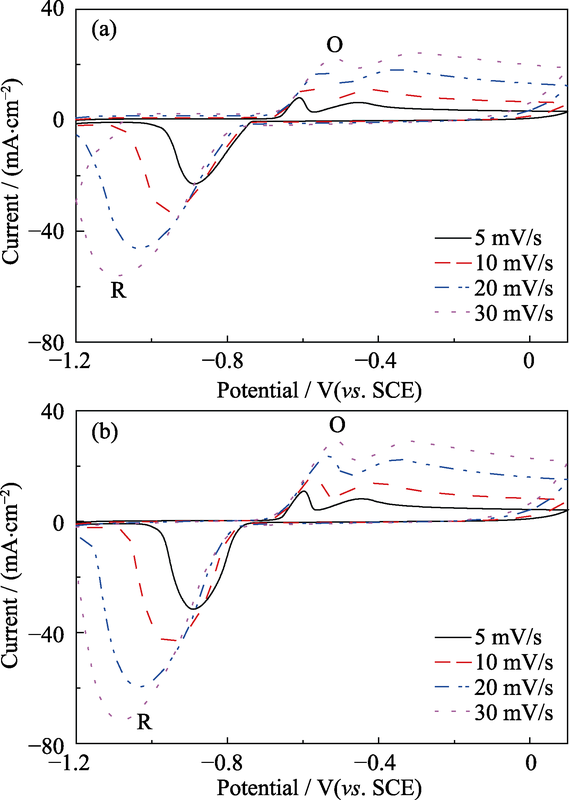 VIVIER V, MEZAILLE S, WU B L, et al.Electrochemical study of Bi2O3 and Bi2O2CO3 by means of a cavity microelectrode I. Observed phenomena and direct analysis of results.J. Electrochem. Soc., 2000, 147(11): 4252-4262. MAI L Q, MINHASKHAN A, TIAN X C, et al.Synergistic interaction between redox-active electrolyte and binder-free functionalized carbon for ultrahigh supercapacitor performance.Nat. Commun., 2013, 4(1): 2923-2931. AGHAZADEH M, GOLIKAND A N, GHAEMI M.Synthesis, characterization, and electrochemical properties of ultrafine β- Ni(OH)2 nanoparticles.Int. J. Hydrogen. Energ., 2011, 36(14): 8674-8679. LI F H, SONG J F, YANG H F, et al. One-step synthesis of graphene/SnO2 nanocomposites and its application in electrochemical supercapacitors.Nanotechnology, 2009, 20(45): 455602- 1-6. SUN L, TIAN C G, LI M T, et al.From coconut shell to porous graphene-like nanosheets for high-power supercapacitors.J. Mater. Chem. A, 2013, 1(21): 6462-6470. 冯晓晶, 王恭凯, 王晓然, 何珺, 王新, 彭会芬. Cr3+掺杂LiSn2(PO4)3负极材料的电化学性能研究[J]. 无机材料学报, 2019, 34(4): 358-364. 王远, 林杰, 常郑, 林天全, 钱猛, 黄富强. 基于三维石墨烯衬底的纳米片状水合氧化钌：电化学沉积制备以及柔性超级电容器储能应用[J]. 无机材料学报, 2019, 34(4): 455-460. 赵世怀, 杨紫博, 赵晓明, 徐文文, 温昕, 张庆印. NiCo2S4@ACF异质电极材料的绿色制备及其超级电容性能研究[J]. 无机材料学报, 2019, 34(2): 130-136. 刘甜甜, 王庆华, 刘希莉, 高凤, 汪庆祥. 近球状钼酸镍/多壁碳纳米管复合材料的制备及其赝电容性能[J]. 无机材料学报, 2018, 33(7): 735-740. 范广新, 刘泽萍, 闻寅, 刘宝忠. 硅烷偶联剂表面处理对LiNi0.8Co0.15Al0.05O2结构和性能的影响[J]. 无机材料学报, 2018, 33(7): 749-755. 王浩, 罗永春, 邓安强, 赵磊, 姜婉婷. 退火温度对无镁La-Y-Ni系A2B7型合金相结构和电化学性能的影响[J]. 无机材料学报, 2018, 33(4): 434-440. 罗凌虹, 胡佳幸, 程亮, 徐序, 吴也凡, 林囿辰. Ba0.5Sr0.5Co0.8Fe0.2O3-δ-Ce0.9Gd0.1O2-δ中低温固体氧化物燃料电池复相阴极的研究[J]. 无机材料学报, 2018, 33(4): 441-446. 张国雄, 陈月梅, 何臻妮, 林川, 陈益钢, 郭海波. 表面活性剂对NiCo2S4纳米薄膜的电化学性能影响的研究[J]. 无机材料学报, 2018, 33(3): 289-294. 刘灿军, 陈述, 李洁. CdS/TiO2纳米晶薄膜的原位法制备及光电化学性能研究[J]. 无机材料学报, 2018, 33(12): 1343-1348. 曾燕飞, 辛国祥, 布林朝克, 张邦文. 一步法制备三维还原氧化石墨烯/NiO超级电容器电极材料及其性能研究[J]. 无机材料学报, 2018, 33(10): 1070-1076. 高秀丽, 王丹丹, 李硕, 邢伟, 阎子峰. 介孔碳微球的氢醌改性及电容性能研究[J]. 无机材料学报, 2018, 33(1): 48-52. 郝燕霞, 钱猛, 徐吉健, 毕辉, 黄富强. 棉花基多孔碳材料的合成、微结构及超电性能研究[J]. 无机材料学报, 2018, 33(1): 93-99. 刘双宇, 徐丽, 陈新, 韩钰, 刘海镇, 盛鹏, 王博, 赵广耀. 石墨烯负载团簇结构CoFe2O4及其电化学储锂性[J]. 无机材料学报, 2017, 32(9): 904-908. 田晓冬, 李肖, 杨桃, 宋燕, 刘占军, 郭全贵. 双金属氧化物和复合材料的合成及其在超级电容器中的应用进展[J]. 无机材料学报, 2017, 32(5): 459-468. 李斯琳, 屠恒勇, 于立军. 中温固体氧化物燃料电池Nd2NiO4+δ-Ce0.8Gd0.2O2-δ复合阴极性能研究[J]. 无机材料学报, 2017, 32(5): 469-475. 严成锋,赵广军,张连翰,徐军. 大尺寸 Ce:Lu1.6Y0.4SiO5闪烁晶体的生长和光谱特性[J]. 无机材料学报, 2005, 20(6): 1301 -1305 . 高峰,张昌松,赵鸣,王卫民,田长生. 流延成型制备(Na0.85K0.15)0.5Bi0.5TiO3陶瓷的显微结构及性能[J]. 无机材料学报, 2006, 21(5): 1134 -1140 . 黄志良,张联盟,刘羽,汪奇林,陈伟,何前军. 水热法合成4A沸石的相变/纳米聚合生长过程及其机理研究[J]. 无机材料学报, 2005, 20(2): 401 -406 . 王要武,蔡砚,何向明,应皆荣. 尖晶石LiMn2O4作为锂离子正极材料的研究与开发[J]. 无机材料学报, 2004, 19(1): 1 -8 . 李 爽,张青红,李耀刚,王宏志. 过氧钛酸水热合成锐钛矿相二氧化钛纳米棒溶胶[J]. 无机材料学报, 2009, 24(4): 675 -679 . 刘鹏,朱满康,代伍坤,王波,丁振亚. 添加氧化物对Ba2TiSi2O8极性玻璃陶瓷析晶性能的影响[J]. 无机材料学报, 2004, 19(1): 53 -57 . 邱羽,高濂. 由硝酸盐尿素配合物前驱体制备过渡金属氮化物粉体的研究[J]. 无机材料学报, 2004, 19(1): 63 -68 .